When I moved to the East Coast a few years ago and my first winter approached, I realized something very quickly: I had to have a pair of "Bean Boots." I noticed that they were a staple for rainy and snowy days, and so much easier to pull on and off than knee-high rubber boots. They've proved to be more than just the perfect shoe for "The Hunt" - they've gone west to Sun Valley and out to brunch in the city. I get a fair few questions about sizing and which height mine are, and I figured now would be a great time to address all that on le blog, especially because you can still get free shipping in time for Christmas delivery on the LL Bean website. I have and love the 8" women's bean boots in the tan / brown color combination. I wear a size 8 shoe typically, and so per the customer reviews, ordered down a size, to a 7, which is a perfect fit. Anyway, I'm pretty obsessed with these boots, and as much as they've saved my feet in cold and wet weather, they're also fun to style, especially with classic camp socks for a very preppy winter look. There. That's my two cents on the LL Bean boot, an essential part of my wild weather uniform. They get better with age, are insanely comfortable and definitely look best if you lace them loosely and leave the top few holes empty. Okay, I'm done - now get some! 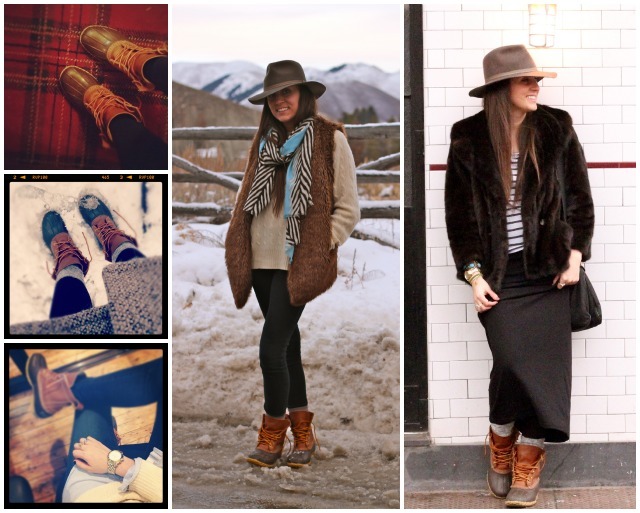 Love my bean boots, thanks for the inspiration on other ways to wear them!